Portia De Rossi seemed to have it all. She was young, beautiful, a successful model and actress with a recurring role on a hit tv show. But behind the facade was a terribly insecure woman, hiding her true sexuality and hating her body, which she always saw as fat. Unbearable Lightness is a memoir of the difficult journey De Rossi faced to come to terms with being a lesbian, and with her natural weight. This book relieved me of some silly assumptions. For example I had always thought, insofar as I bothered to think about them at all, that all actresses and models were interested in fashion, makeup and glamour. It stands to reason, now that I think about it, that some of the many people in show business are really just more comfortable in an old Iggy and the Stooges shirt, ripped jeans and Doc Martens. Apparently De Rossi is one of those people. Before reading this book I didn't know much about eating disorders. I still don't really, since thankfully I have never lived that nightmare but I know more than I did before reading this book. There was a time, back in my teens and early twenties when I didn't take the idea of eating disorders at all seriously. I just thought of them as something self inflicted and silly that people could just get over if they really wanted to. It was only later when I actually met a couple of people who had suffered from anorexia, and a fellow mother whose daughter is suffering from it now, that I came to understand how awful and damaging it actually is, both to the person with the disorder and their friends and family. This book would be a big help to anyone who, like me, was trying to understand what it's like to live with an eating disorder. It's only one person's journey, and doubtless it's different for everyone, but Unbearable Lightness should at least give the clueless among us an inkling. I found at first that I could only read the book in small chunks at a time because I found De Rossi's negativity and self hatred hard to take. I think if I actually heard someone talking about themselves this way in person I'd be torn between wanting to slap them and give them a big hug. De Rossi writes evocatively about her fears and the rituals and strange behaviours her eating disorder led to, such as giving up toothpaste for fear of ingesting stray calories, and running up and down the stairs in her building while wearing five inch platform shoes to burn off a pack of gum. It was interesting to learn that the process of recovery wasn't over when most people would think it was, ie. once she had gained the weight back. It really wasn't finished until she finally stopped obsessing about food. Ultimately De Rossi writes of her discovery of the strangely controversial secret to maintaining a healthy weight- just eating what you want and exercising moderately. By saying "just" I don't mean that this process was easy for her. In fact it sounded very difficult, but she got there, and hopefully this book will inspire others to do the same. In the course of the book De Rossi also finally came out to her brother, then eventually her extended family and the rest of the world. It didn't end her career the way she feared and hopefully her continued success will also inspire young gay people still in the closet to come out when they are ready. 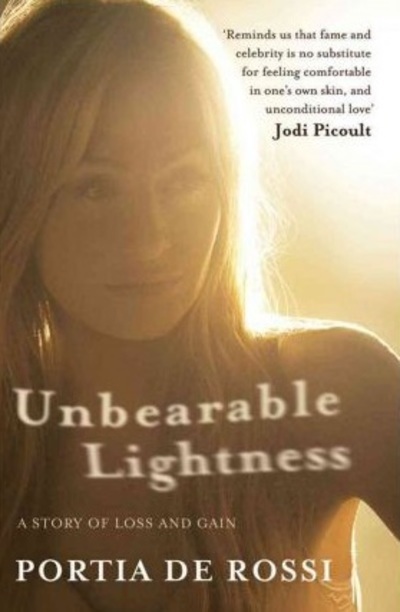 Unbearable Lightness is a very moving book about learning to accept yourself for who you are and trusting that the people who love you will do the same. What are you reading in December 2017?